Merci, Paris, for a spectacular weekend! London will always be my favorite, but spending this past weekend in Paris made me realize why everyone loves it so much. It was beyond gorgeous. Even in the wind and rain, the beauty of the white stone buildings made the whole city feel like a palace. 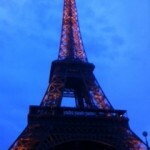 The Eiffel Tower was much bigger than I had imagined, and the view from the top was amazing! When we came back down, I ate a crepe under the Eiffel Tower, probably the most ‘French’ thing to do possible. The second day our tour group walked through Montmartre. I saw the largest mosaic art piece in the world at Sacred Heart Church, bought a really nice silk scarf of a Monet water color painting, saw the Moulin Rouge, and then departed Paris for a trip to the Palace of Versailles. I’ve studied Versailles a lot, but never completely grasped how massive it was until I saw it in person. No wonder there was a revolution! It was over-the-top decorated with more paintings and gold trim than imaginable. Unfortunately, the huge crowds packed in each room took away from the awe, and it was an additional fee to visit the gardens, which would have required more time to fully appreciate than I was allowed. That night I ate dinner at an old wine warehouse with a few other people from my tour group. The food, wine, and creme brulé were delicious! 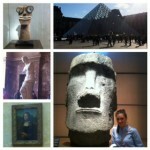 We spent our last day in Paris visiting the Louvre art museum. It was a bit overwhelming to see so much art in one place. The building itself was huge, but again the crowds of people really took away from the experience. I risked my life pushing through tourists to snap a shot of the Mona Lisa (which was surprisingly smaller than I pictured). After the Louvre we took the Eurostar back to London. The trip was expensive, but I valued having a guide and not stressing about how to get from place to place like in Germany. In other news, I shattered my iPhone by dropping it down the center of a spiral staircase. I’ve had an iPhone for almost 3 years and never even scratched a screen until now. Fortunately I brought my old phone here with me and can use it when I’m on wifi. Europe in general has been good about having wifi connections, so I’m not too worried. My goal this week is to do at least half of the things on my ‘To Do’ list, which includes writing papers, reading books, and sending post cards. I’ve vowed to stop buying clothes and only spend money on food, respectable souvenirs, and memorable experiences. We’ll see how long that lasts. It’s hard to believe my time here is already half way over. I’m homesick for my nieces and American food, but I can’t say I’m at all looking forward to leaving London.